I’m surely not alone this week in taking a deep breath and considering those things for which I am grateful. Here are ten for 2009. Microwave/Toaster Oven: It’s a hybrid. It provided for me when the gas company decided to halt my gaseous flow this summer simply because I didn’t mail them a check. They’re so particular. J-O-B: First, I have one. Plus, it became even better with an itty bitty promotion and new view of the taco truck down the street that sings its siren song over me daily. Sudafed: When I had the influenza, this purchase-behind-the-counter miracle was just that. Kara and Caryann: My two besties are oddly fabulous. One is trying to raise two young special boys and the other is trying to romance one special boy. Butter: Bakers kept telling me it is the Holy Grail. I finally decided to embrace the churned goodness. My coworkers are better for it. 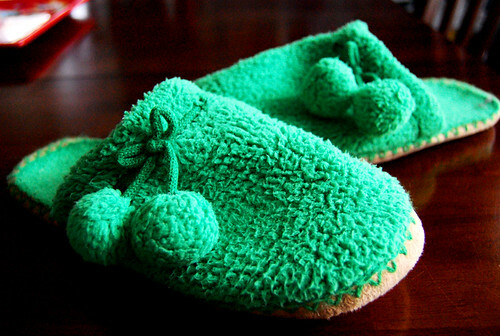 Green Pom Pom Slippers: My gas company can try as they might, but I have these. I don’t need ya stinkin’ heat. Mom & Dad: They’re kinda great. In that way where you get ginger ale when you’re sick and your new sink gets magically installed. Recycled Bags: This was the year when I completely converted to keeping the earth a tad tidier. And ticking off every cashier at the less-than-tidy Mal-Wart. Bugs, My Phone: I previously mocked those who cradled their iPhones close to their chest. Hi, my name is Jamie and I’m a cradler. God: I poked at His chest a bit this year and He let me. Then He asked me where I was when He created Mount Everest and I calmed down. So let’s hear it. What gets your thankful going? I am thankful for my wonderful daughter and son, my husband and my life, but most of all for my Lord and Savior, Jesus Christ. To God be the glory. I have so much to be thankful for. Woderful, loving family, great co-workers, friends, freedom, to be lucky enough to live in the USA and the right to worship our God. Doing my own thankful post at the moment. Thanks for reminding me! N: You're a great co-worker too. Since I know you were referencing me, right? M: Can't wait to read it! It seems kind of boringly obvious to go with the husband, but really he is so cool. And I'm so lucky that he thinks I'm cool too.